The CT110 can be seen as the little brother of the CT160 . This machine has all the advantages of a ride-on model but thanks to the innovative design he keeps the manoeuvrablility of a walk behind model. The CT110 can be seen as the little brother of the CT160 . This machine has all the advantages of a ride-on model but thanks to the innovative design he keeps the manoeuvrablility of a walk behind model. The CT110 owes its incredible manoeuvrability to its exceptional radius of rotation. The CT110 contains all the newest technologies in one compact and very manoeuvrable machine, resulting in a professional “ride-on” scrubbing/suction machine (sitting model), designed in order to perform the most divergent cleaning jobs. A robust, solid machine, created with a modern design. This scrubbing/suction machine offers you a tremendous efficiency, as well as a large productivity. 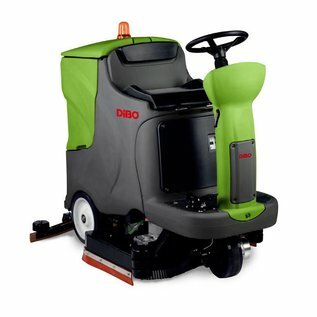 The big tank capacity and the high capacitive qualities of the battery make that this equipment is perfectly destined for extreme cleaning activities within large to very large spaces. The mechanical drive (no V-belts) also guarantees that this scrubbing machine has a long and maintenance-friendly lifespan. The machine exists also in a model with two cillindrical brushes, both models are supplied without batteries (6x 6V DC). The soundproofing system guarantees low noise levels (<65 dB(A)). Solution supply possibility: in ECO mode for constant savings; in automatic mode according to machine speed. Brushes and suction motors adjustment: further decrease of energy consumption; more noise reduction. Solution supply possibility: in ECO mode for constant savings; in automatic mode according to machine speed. Control panel Brushes, solution and vacuum inserted by one unique command or singularly upon necessity. CFS-system : Solution distribution from brush center avoids solution wastes. SLS-system : Self-levelling mechanical system for an always perfect adherence between brush and floor.